by Rebecca Santana, Associated Press. Thu Dec 30, 4:48 pm ET. BAGHDAD – Militants attacked at least four Christian homes Thursday night with a combination of grenades and bombs, killing two people and sending fear into the already terrified tiny Christian community. It was the first attack against the country's Christian community since al-Qaida-linked militants last week threatened a wave of violence against them. Christians went so far as to tone down their Christmas celebrations in what was a peaceful holiday, but the attacks Thursday night demonstrated the intent of militants to keep up their deadly pressure on the Christian community. In the deadliest attack, assailants in southwestern Baghdad threw two grenades inside the home of a Christian family, killing two people and injuring five more, police said. In a different neighborhood in eastern Baghdad, militants planted a bomb near a Christian home. Two people were injured in that attack. Then another bomb planted near a Christian house in western Baghdad exploded, injuring one member of the family as well as a civilian who was driving by, police said. Iraqi military spokesman Maj. Gen. Qassim al-Moussawi confirmed that two people were killed Thursday evening; he said a bomb planted near the fence of a Christian home in southern Baghdad also exploded but he had no information about casualties in that incident. "The aim of these attacks is to prevent Christians from celebrating the New Year's holiday," al-Moussawi said. The casualties were confirmed by hospital officials. All the officials spoke on condition of anonymity because they were not allowed to talk to reporters. The attacks are sure to ratchet up tension in the tiny Christian community still living in Baghdad. 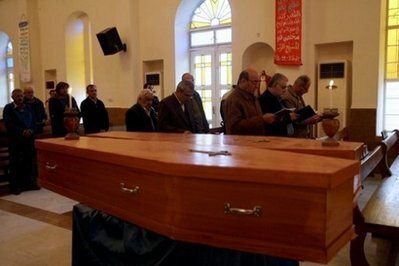 At least 68 people were killed in October when militants stormed a Baghdad church during Mass and took the congregation hostage. Thousands of Iraqi Christians have fled to northern Iraq, fearing further attacks. Father Mukhlis, a priest at the Our Lady of Salvation church in Baghdad where the Oct. 31 hostage incident occurred, called the Thursday attacks "direct oppression" against Iraqi Christians. He said one Christian family already was staying at the church because they were worried about militants targeting their home. The family was planning to travel Friday to the Ninevah Plains area of northern Iraq which is home to a large Christian community and much safer than the rest of Iraq. Last week, al-Qaida warned of further violence against Christians, leading many in the community to tone down their Christmas celebrations and cancel many events such as evening Mass and appearances by Santa Claus. The Christmas holidays also coincide this year with the Shiite holy month of Muharam, an important holiday for the country's Shiite Muslim majority. Some Christians said they were also playing down the Christmas holiday this year out of respect for their Shiite neighbors, but other Christians reported intimidation by members of the Mahdi Army, a Shiite militia backed by anti-American cleric Muqtada al-Sadr, who pressured them not to celebrate the holiday publicly. Christian leaders estimate 400,000 to 600,000 Christians still live in Iraq, according to a recent State Department report. At one time before the war, that number was as high as 1.4 million by some estimates. Associated Press writer Qassim Abdul-Zahra contributed to this report.